H. Rick Bamman - hbamman@shawmedia.com Woodstock Harley Davidson mechanic Pete Arsenty repairs a bike in the facility's service department on Monday, April 7, 2014. The Illinois DOT and the Illinois Motorcycle Dealers Association joined forces to kick off the 2014 riding season's "Gear up-Ride Smart" motorcycle safety campaign. 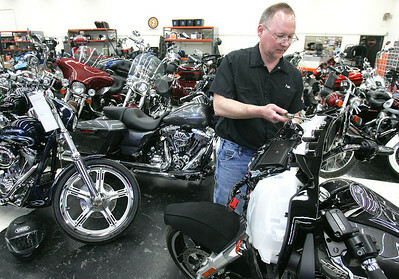 H. Rick Bamman - hbamman@shawmedia.com Woodstock Harley Davidson employee Codey Hamm of Wonder Lake prepares a customer's bike that was in winter storage on Monday, April 7, 2014.The Illinois DOT and the Illinois Motorcycle Dealers Association joined forces to kick off the 2014 riding season's "Gear up-Ride Smart" motorcycle safety campaign. H. Rick Bamman - hbamman@shawmedia.com Woodstock Harley Davidson employee Kathy Barlow describes a two shield mortorcycle helmet. 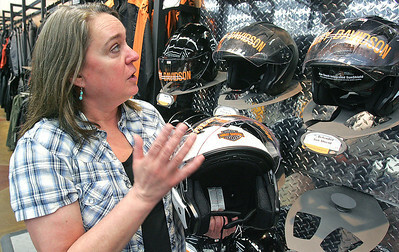 Woodstock Harley Davidson employee Kathy Barlow describes a two shield mortorcycle helmet.